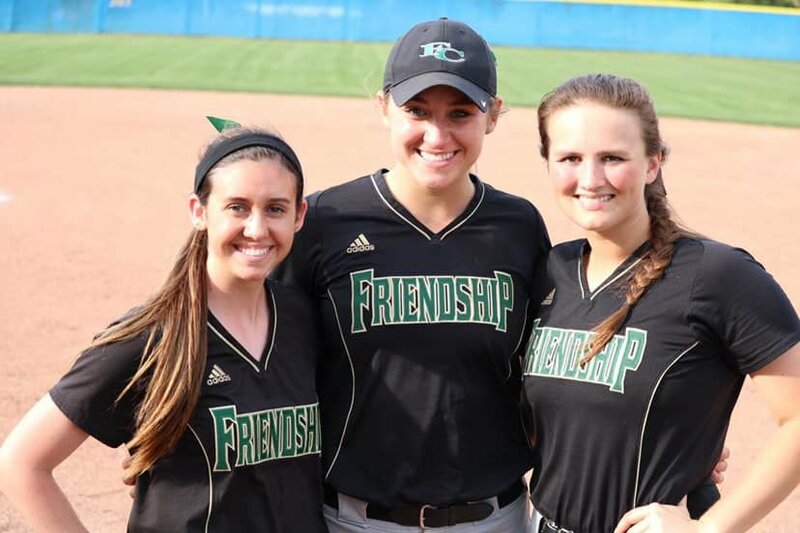 Friendship Christian seniors, from left Cameron Burton, Sydney McCormick & Bayley West. MT. JULIET-- Brooke Jones and Anna Belle Cooksey drove in four runs apiece as Friendship Christian School hammered Mt. Juliet Christian 15-1 Thursday afternoon at Don Wharton Field. With the win, the Lady Commanders moved to 21-5 on the season headed into a 4:30 p.m. home game Friday, April 12 versus Goodpasture. Jones had a double and two singles while Cooksey had a pair of two-run singles as FCS scored six in the top of the second, one in the third and eight in the fourth. Hannah Alexander tripled and had two singles in three times at bat to drive in two runs; Cameron Burton had a double and a single, two RBI and scored twice. Kennedy West scattered six hits in four innings with nine strikeouts and two walks for the decision. LEBANON -- Pitcher Addison Fuller worked around seven walks, but allowed only four hits, Thursday as Lebanon blanked District 9-AAA rival Beech High School. With the win, the Lady Devils improved to 10-8 headed into the Ravenwood Raptor Classic at Crockett Park. LHS is scheduled to play two games Friday -- v. Brentwood High at 4 p.m. and Summit High at 5:30 p.m. The Lady Devils will wrap up pool play with a 9 a.m. Saturday v. the Rockets of Forrest High. In Thursday's win over Beech, Lebanon took a 1-0 lead in the bottom of the first as Madi Kimble stroked a two-out solo home run. The Lady Devils tacked on two runs in the sixth on a two-out homer to dead center by Bailey Lasater -- scoring Alaina Smith who had reached on a single. Kyleigh Burton and Addie Grace Porter had Lebanon's only other hits -- singles. GLADEVILLE -- Wilson Central pounded out 14 hits in Thursday's District 9-AAA home win over Station Camp. Kaylee Richetto went 4-for-4 and hit her fifth home run of the season. Richetto went the distance in the circle, scattering eight hits and striking out three. Catcher Grayce Guethlein finished 3-for-3 at the plate while Kenzey Meador and Sydnee Richetto each had a pair of hits. WCHS is scheduled to play three games Friday, April 12 in the Ravenwood Raptor Classic, including: 4 pm vs Independence; 7 pm vs Creek Wood and 8:30 pm vs Dyersburg . Wednesday, April 11 action found the Lady Wildcats defeating Portland 7-3 as Mekayla Marshall bopped a three-run homer in the first inning and Kaylee Richetto blasted a grand slam in the fourth. CARTHAGE -- Watertown made the most of seven hits and took advantage of nine Smith County errors in Thursday's 11-2 District 8-AA road victory over the Lady Owls. Now 6-9 on the season, got RBI doubles from Brittni Allison and Ridge Morgan while Jada Moss had a single and a double in five trips to the plate. Zoe Baskin went the full seven innings for the decision, scattering seven hits with two walks and two strikeouts. MT. JULIET -- Gabby Faccadio and Kailey Brimm slugged home runs in support of Alyssa Costley's five-inning one-hitter as Mt. Juliet run-ruled visiting Hendersonville 10-0 Thursday in a District 9-AAA contest. Costley struck out six batters and walked one as the Lady Bears upped their record to 17-7-1 headed into a Tuesday, April 16 game at Beech. Mt. Juliet scored twice in the bottom of the first, then added three in the third and five more in the fourth inning to invoke the "mercy rule". Brimm hit a solo homer to lead off the fourth, then later in the inning Faccadio lofted a two-run shot to left. Faccadio added a double to her HR and three RBI while Laney Tucker chipped in with a two-run triple.